Since 1980, total global energy consumption has increased more than 85% from 283 quadrillion British thermal units (BTU) to more than 524 quadrillion BTU in 2012. Projecting forward, the International Energy Outlook 2013 Report estimates global energy demand will increase by 56% to 820 quadrillion BTUs by 2040 (USDOE/EIA, 2013). The growing demand for energy is persuaded by a number of factors such as population, consumer behavior, transportation, and economic structure. According to the 2014 U.S. Census Bureau estimates, Ohio is the 7th largest state in the country with population of more than 11.5 million people (U.S. Census Bureau, 2014). Ohio’s economy is driven by its robust manufacturing sector, led by high energy-intensive industries, such as strong metals fabrication and chemical production industries. In 2013 Ohio’s industrial sector ranked 7th in the nation for total energy consumption, consuming an estimated 1,216 Trillion BTUs (USDOE/EIA, 2015). While Ohio employment directly related to the production of coal, oil and gas, energy is less than 1% of the total employment; many rural communities across Ohio have been dependent on jobs in the energy sector. In addition, the overall economy depends on access to affordable and reliable energy to power the robust industrial sector. This fact sheet provides a summary of Ohio energy production and consumption trends for the coal and oil and gas industries and the impact of energy employment in rural communities. We learn by the Cincinnati Railroad Record that no less than 23,800,000 bushel are dug yearly from the Ohio coalfield. The price is 12½ cents per bushel, and is cheaper for fuel than wood at $5 per cord. The Ohio coalfield embraces an area of 12,000 square miles, and is really more valuable than the same extent of gold. This coalfield is bituminous, and no doubt there are different qualities of it, so that it will furnish gas for illumination and fire for heating and manufacturing purposes. The Record asserts, that steam mills are more economical in that State than water mills, and that steam-flouring mills have rapidly sprung up near the railway depots, where the handling of wheat, coal, and flour is so easily performed. Ohio is certainly a State full of natural resources (Ohio Coal, 1854). While early uses of coal were predominantly for residential home heating and to power steam engines for transportation, it was also central to the industrialization of Ohio. Considering more than 215 years of historical coal production, there have been two notable spikes in the Ohio production timeline (Chart 1). The first spike started midway through the 19th century ultimately cresting in 1918, with more than 47 million tons of coal production. This spike was largely driven by the demand for coal to power the industrialization of cities such as Cleveland, Ohio. In the 1830s, Cleveland’s role in the American Industrial Revolution propelled the region into a leader of heavy industrial manufacturing of iron and steel products. As iron and steel mills were established in northeast Ohio, coal was a critical raw material used as a fuel for the blast furnaces in the production process. According to Rerick (1902), “In 1886 Ohio made as much pig iron as the entire product of the United States in 1859” (p. 402). The spike in Ohio coal production from 1870 to 1920 is accompanied by the rise of manufacturing in Cleveland. “As late as 1870, Cuyahoga County, where Cleveland is located, ranked number twenty-two in manufacturing output among counties nationwide; by 1920, it had risen to fourth place” (as cited in Lamoreaux, Levenstein, Sokoloff, & National Bureau of Economic Research, 2004, p.3). The second spike originated in the midst of the 20th century peaking in 1970 when Ohio coal production reached an all-time high of more than 55 million short tons. Throughout time, technological advancements and new techniques such as surface mining contributed to the increased production of coal. Traditional underground mining involves removing the coal deposits through a network of underground tunnels and shafts, without disturbing the remainder of the geological materials. Conversely, surface mining, also referred to as strip mining, open pit mining, and mountaintop removal mining is a process where the soils, rocks, and mineral deposits are all removed. While the first reports of surface mining in Ohio date back to 1810, the production impacts of the new mining technique were not truly recognized until after 1930. While in the 19th century the demand for coal was driven by industrial manufacturing processes, the 20th century experienced the rise of the electrical power sector. As illustrated in Chart 1, the spike of Ohio coal production between 1930 and 1970 parallels the cumulative addition of coal electric generation facilities in Ohio. The additional demand for coal in the electrical generation sector combined with the continued use of coal in the industrial sector supported the increased demand of coal through 1970. 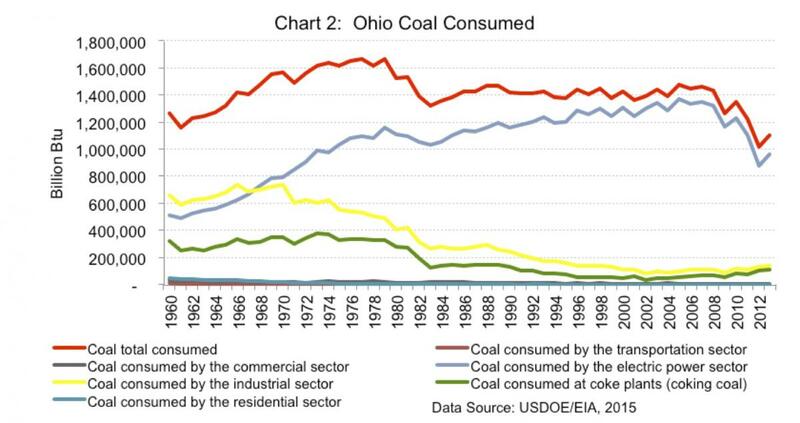 However, following 1970 coal consumed by the industrial sector in Ohio declined significantly, leaving the electric power sector the primary consumer of coal (Chart 2). Ohio coal production in the 21st century is a much different story. From 1970 to 2000, Ohio experienced a significant decline in coal production, with the industry producing just over 22 million short tons in 2000. While the industry did grow slightly over the next decade, producing 28 million short tons by 2011, the production was still lower than the state’s production in 1941. In 2013, Ohio was the 10th largest coal producing state in the nation and the fourth largest consumer of coal. Although Ohio’s electric generation sector traditionally generates more electricity from coal than any energy source, the industry appears to be in the midst of a major energy transition. For example, coal’s share of the electrical net generation mix has dropped from 87% in 2001 to 67% in 2014, while share from natural gas over the same period has grown from 1% to 18% (USDOE/EIA, 2015). While this transition is influenced by a number of factors including economics, market conditions and technology, the growing environmental concerns of greenhouse gas emissions from the electric power generation sector has also led to additional regulations on the industry. For example, the Mercury and Air Toxics Standards, Cross State Air Pollution Rule, and Cooling Water Intake Structure Rule are designed to reduce the environmental impact of the electric power generation sector and expected to result in the increased retirement of coal fired electric generation facilities. Ohio has a long history of oil and gas production dating back to the Thorla-Mckee well drilled in 1814 in Noble County. This was one of the first oil-producing wells in the nation (Deisher, 2015). In 1860, just south of Noble County, one of the state’s earliest producing oil fields emerged in Washington County, as oil derricks appeared across the Macksburg oil field. In this search, there has been an immense expenditure of money. Drilling alone has absorbed a very large amount. But where the drill has been successful it has in many instances laid the foundation for a wonderful increase in the volume of business and an equally remarkable enhancement of the price of real estate. The investments following the discovery of natural gas in Ohio and Indiana towns for the last two years will aggregate tens and possibly scores of millions of dollars (Orton, 1889). In 2013, Ohio was the 16th (186,181 million cubic feet) largest natural gas producing state in the nation and the 14th (11,611 thousand barrels) largest producer of crude oil. 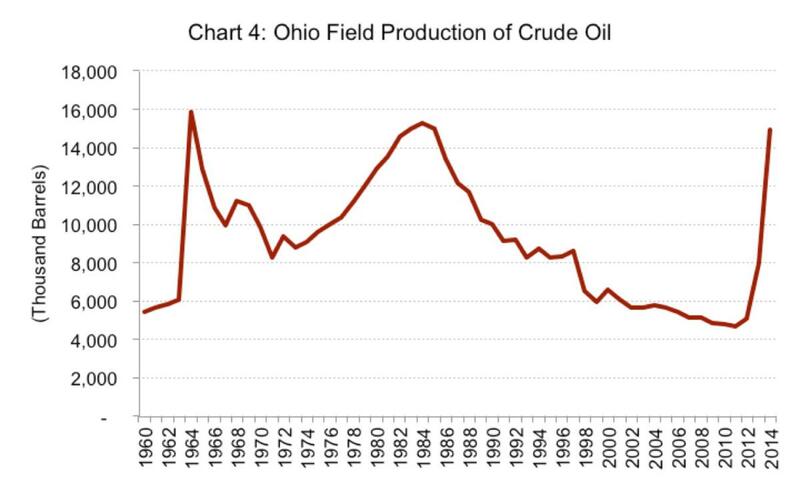 While hydraulic fracturing has a long history in Ohio, recent technological advancements have unlocked oil and gas resources from the Ohio Marcellus and Utica Shale formations once thought to be uneconomical to recover. 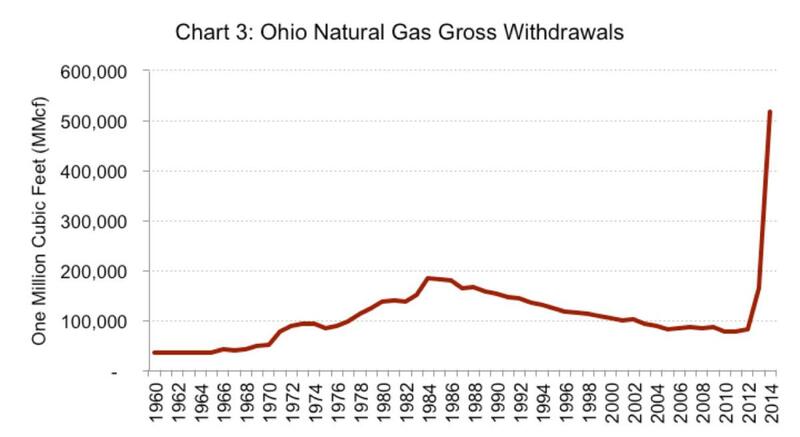 The recent growth in horizontal hydraulic fracturing combined with the continued production from the state’s many conventional wells has positioned Ohio as one of the fastest growing natural gas production regions in the United States (Charts 3 and 4). When analyzing demand, in 2013 Ohio ranked eighth in the nation for natural gas and petroleum consumption, consuming an estimated 946.4 trillion BTUs of natural gas and 1,168 BTUs of petroleum. 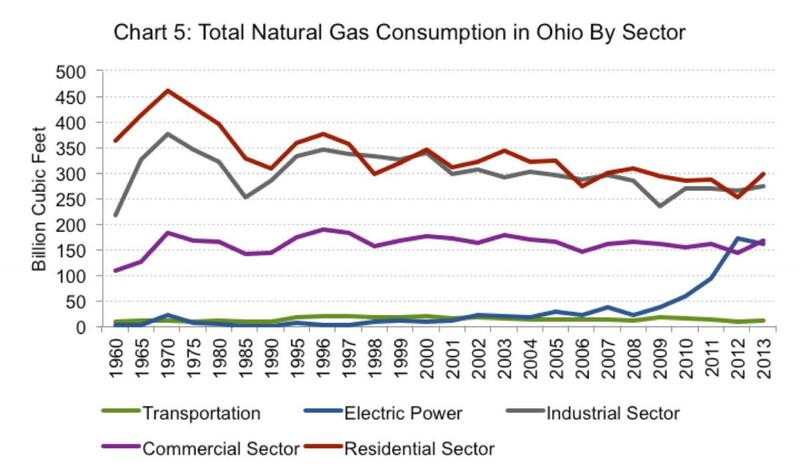 As illustrated in Chart 5, natural gas consumption in Ohio is traditionally driven by the industrial and residential sectors. However, as mentioned earlier the electric power sector in Ohio appears to be in the midst of a major transition away from coal, leading to a growing demand for natural gas for electric power generation. For example, starting in 2008 the electric power sector consumed 23 billion cubic feet of natural gas, growing to 161 billion cubic feet in 2013. 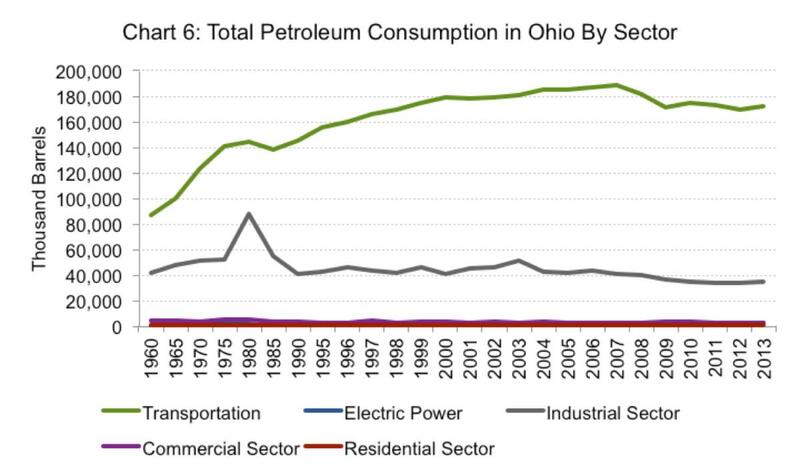 As Chart 6 shows, the transportation sector is the primary driver of petroleum consumption in Ohio, experiencing steady growth from 100,013 thousand barrels in 1965 to 172,065 thousand barrels in 2013. Whether referring to the historic coal mines, green jobs, or the current oil and gas boom, the energy sector has long been associated with job creation. While jobs are valuable to local economies and new economic activity related to energy development can be exciting, it is important to keep things in perspective. For example, the 2015 Ohio Shale Report from the Ohio Department of Job and Family Services indicated that core shale related employment increased from 6,873 in the second quarter of 2011 to 13,624 jobs in the second quarter of 2014. While the increase in that specific sector is significant, it represents less than 1% (0.002%) of Ohio’s 2014 total employment of 5.2 million. Although Ohio employment directly related to the production of coal, oil and gas energy is typically less than 1% of the Ohio total employment, many rural (non-metro) communities across Ohio are dependent on jobs in the energy sector. The influence of energy employment on rural counties is noteworthy because a large dependence on energy jobs has the greatest relative impact in less-populated communities. For example, there has been research suggesting the dependency on coal mining as the primary economic driver in the Appalachian region of eastern Ohio has contributed to higher poverty rates (Partridge, Betz, and Lobao, 2013). As described earlier, Ohio appears to be in the midst of an energy transition that includes declining coal production while investments in natural gas exploration, extraction, and infrastructure have produced a significant spike in production. How will a transition from coal to natural gas affect energy related jobs in the region? It is important to first consider that on a unit per unit basis, natural gas actually requires fewer jobs to produce a kWh of electricity compared to coal. However, the use of natural gas extends well beyond electricity generation, as it is used for residential heating, in various applications in the industrial sector, and as transportation fuel. In summary, if Ohio experiences continued job growth around oil and natural gas development, in addition to any gains in the oil and gas sector, it is essential to consider any adverse effects to other sectors of the local or regional economy. This will provide a clearer framework of the structural changes in the economy to inform the current metrics of success and critical needs for future planning. This material is based upon work that is supported by the National Institute of Food and Agriculture, U.S. Department of Agriculture, Agriculture and Food Research Initiative, under grant #11400612 titled “Maximizing the Gains of Old and New Energy Development for America’s Rural Communities.” The authors acknowledge and appreciate the support of both the USDA AFRI grant and the project team from The Ohio State University, College of Food, Agricultural, and Environmental Sciences, and Department of Agricultural, Environmental and Development Economics. Any opinions, findings, conclusions, or recommendations expressed in this publication are those of the author(s) and do not necessarily reflect the view of the U.S. Department of Agriculture. Deisher, J. L. (2015). GeoFacts No. 29: The Macksburg oil field. Ohio Department of Natural Resources, Division of Geological Survey, Columbus. Haneberg-Diggs, D. M. (2015). GeoFacts No. 30: The “Clinton” Oil-And-Gas Play In Ohio. Ohio Department of Natural Resources, Division of Geological Survey, Columbus. Lamoreaux, N. R., Levenstein, M., Sokoloff, K. L., & National Bureau of Economic Research. (2004). Financing invention during the second industrial revolution: Cleveland, Ohio, 1870-1920. Cambridge, Mass: National Bureau of Economic Research. Ohio Coal. (October 21, 1854). Scientific American, 10, 6, 48. Orton, E. (1889). The Trenton limestone as a source of petroleum and inflammable gas in Ohio and Indiana. Washington: Govt. Print. Off. Partridge, M. D., Betz, M. R., & Lobao, L. (January 01, 2013). Natural Resource Curse and Poverty in Appalachian America. American Journal of Agricultural Economics, 95, 2, 449-456. Rerick, R. H. (1905). History of Ohio: Covering the periods of Indian, French and British dominion, the territory Northwest, and the hundred years of statehood. Madison, Wis: Northwestern Historical Association.